Resources - Piontek Funeral Home Inc. The following checklist is designed to help you file for your Social Security benefits. WHO MAY RECEIVE MONTHLY PAYMENTS? A divorced widow or widower age 60 or older (50 if disabled), if the marriage lasted 10 years, or if caring for an entitled child who is under 16 or disabled. Unmarried children up to 18 (19 if they are attending a primary or secondary school full time). Under certain circumstances, benefits can be paid to step children, grandchildren or adopted children. In addition to the monthly cash benefits described above, a one time payment of $ 255.00 may be paid. The lump sum death payment is paid in the following priority order. The Social Security website is a valuable resource for information about all of Social Security's programs. There are a number of things of things you can do online. The name of the bank and your account number so your benefits can be deposited directly into your account. Former military members who completed at least one term of enlistment or period of inital obligated service in the Selected Reserve and departed under conditions other than dishonorable. 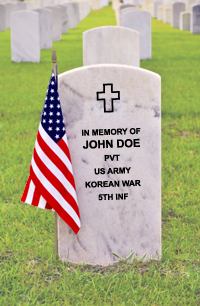 The Department of Veterans Affairs (VA) furnishes upon request, at no charge to the applicant, a Government headstone or marker for the unmarked grave of any deceased eligible veteran in any cemetery around the world, regardless of the date of death. For eligible veterans that died on or after Nov 1, 1990, VA may also provide a headstone or marker for graves that are already marked with a private headstone or marker. When the grave is already marked, applicants will have the option to apply for either a traditional headstone or marker, or a new device (available spring 2009). Flat markers in granite, marble, and bronze and upright headstones in granite and marble are available. The style chosen must be consistent with existing monuments at the place of burial. Niche markers are also available to mark columbaria used for inurnment or cremated remains. Spouses and dependents are not eligible for a Government-furnished headstone or marker unless they are buried in a national cemetery, state veterans' cemetery, or military post/base cemetery. You may apply for the flag by completing VA Form 21-2008 (Application for the United States Flag for Burial Purposes). You may get a flag at any VA regional office or U.S. Post Office. Generally, the funeral director will help you obtain the flag. 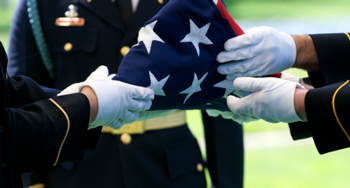 The law allows us to issue one flag for a veteran's funeral. We cannot replace if it is lost, destroyed, or stolen. 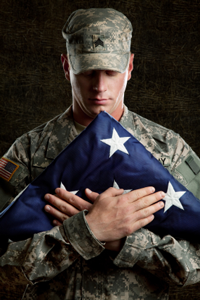 However, some veterans' organizations or other community groups may be able to help you get another flag.